THE JESUITS. 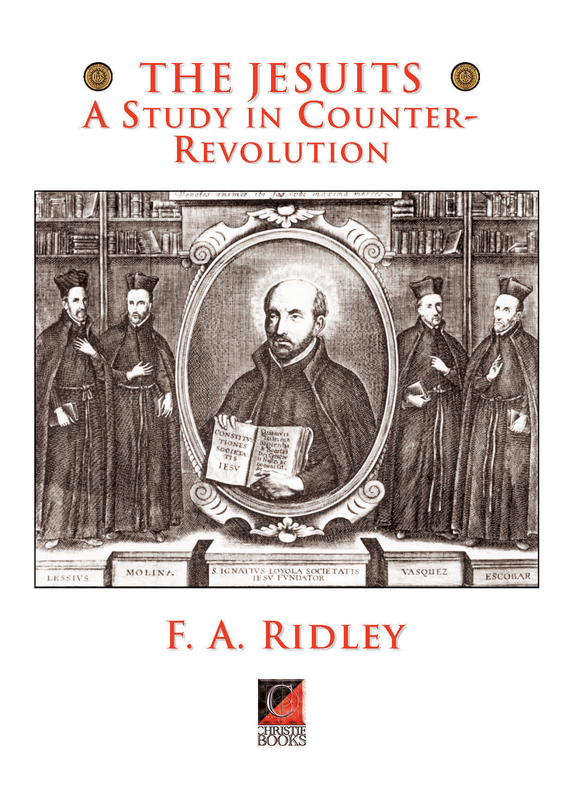 A STUDY IN COUNTER-REVOLUTION by F. A. Ridley. Marxist secularist Frank Ridley (Francis Ambrose Ridley: 22 February 1897 – 27 March 1994) was a long-standing friend of Albert Meltzer, whom he visited regularly at Albert’s Coptic Street Bookshop — which is where I met him, in 1967-68, in my role as Coptic Press printer and general dogsbody. Albert, who was a great fan of Frank’s work, wanted to republish some of his long out-of-print books, including ‘The Assassins’ and the present work, ‘The Jesuits. A Study in Counter-Revolution’, but given our resources at the time it proved impossible. I did promise that we’d re-publish it one day, which turned out to be today — much later than we’d hoped-for and too late for them to see: Frank died in 1994 and Albert died two years later. At least in its present format, as an eBook, it is now available for new generations of readers who, otherwise, would have been unlikely to come across Frank’s fascinating and learned account of the Pope’s Jihadis, the ‘Assassins of Christendom’, and the shock-troops of the Catholic counter-revolution. This book, then, seeks to substitute historical dialectics for theology or archaeology as the chief clue to the investigation of the great medieval reaction of four centuries ago. For perhaps the first time, it shows Loyola’s ultimate significance as the leader and founder of the most successful counter-revolution in history, a counter-revolution which preserved half Europe and Latin America under the yoke of medievalism until quite recent times, and whose effects can be seen in Spain and elsewhere to this day It is, therefore, fundamentally as a study in counter-revolution that the career and historic significance of Ignatius Loyola, and of his masterpiece, the Society of Jesus, is here presented.